Brandon was born at Solace where he grew up witnessing all the turmoil of the age we call War of the Lance. At the age 7 he encountered the Heroes of the Lance and he took care of their horses as that time he was working as a stable-boy at the Inn Of Last Home. That night one of the horse tired by exhaustion run wild. Brandon was determined to find and calm down the beast of burden. He finally found the horse and after an hour or so he managed to calm down the horse. Unaware of his surroundings Brandon failed to notice the presence of Sturm Brightblade who was searching also for the horse. Sturm looked down the young boy and he told him the story of the legendary hero Huma. Under the light of Solinari, Brandon got inspired and that night was never forgotten. It was the last night of peace at the world of Krynn as the war of the lance began. · Aspects: You gain your 1st Aspect. So for Brandon we are choosing Stable-boy at the Inn of the last home. Keeping 2 extra Aspects for later use. Then the dragon armies invaded the lands of Ansalon and chromatic dragons, once more, dominated the skies looking forward to hunt and exterminate all good that’s left in the world. During that times Brandon, as the rest of the people, tried to survive and he actually managed to stay alive until the end of the war of the lance. After the bloody war Brandon, at the age of 16, sought to find Sturm but then he learned about the noble sacrifice of the knight during the battle of High Clerist’s Tower. Then Brandon decided to join the ranks of the ancient Solamnic Knighthood. Brandon’s players choose the 2nd aspect that of squire of knights of the crown. (After two years) Rise! Brandon, Squire of the Crown. Finally Brandon became a Squire of the Crown and he is a 1st level Warrior gaining his abilities normally. Also he choose his 3rd and last Aspect; Squire of the Crown. 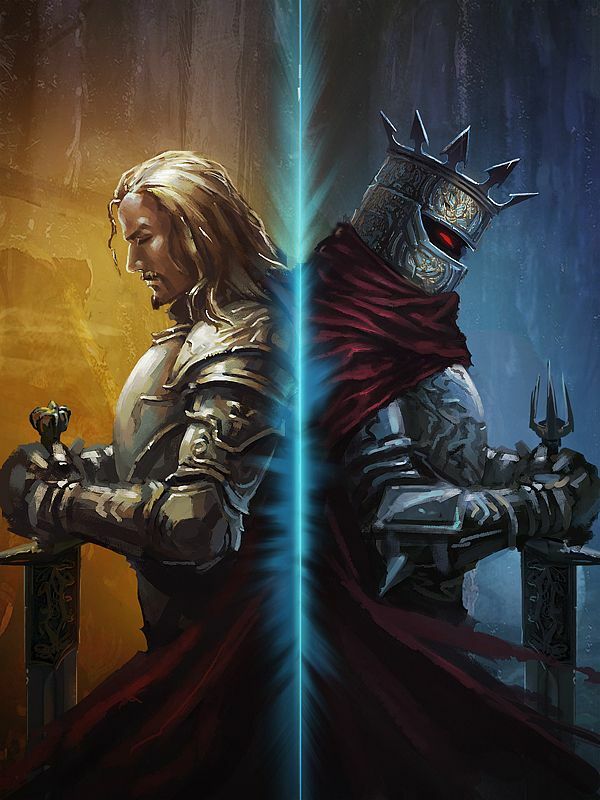 Both Aspects (squire of knights of the crown & Squire of the Crown) hold more or less social benefits which can be use either in favor or against him. You may wonder why against but after the war of lance the knights are trying to restore their name to the world. Even after Sturm’s death there are places where the knights weren’t welcomed. So Brandon is leveling normally as warrior and his next stop it would be at level 4 where he will have to choose another aspect. Squire of the Crown, Brandon, you proved your worth to the order and we are pleased by your excellence at the art of war and the way of the measure. Will you continue as Knight of the Crown or ask in the eyes of the gods to get promoted? At 4th level Brandon choose to become a Knight of the Sword the 2nd order within the Solamnic Orders. So the storyteller prepares his trial (at least a 30 days journey over 500 miles). The quest to become a knight can take any form for example: retrieve an object, duel an evil, defeat a menace single handed etc. If he successes he becomes a Knight of the Swords. So at 4th level he gains the Aspect: Knight of the Swords. From now on he is Sir Brandon. At ad&d there was a spellcasting table for Knights of the Sword which was based on a weekly replenishment. In sake of simplicity I decided to give Sir Brandon a few spells which can be used under the core spell casting rules. But if you want to be closer to the original concept then give the Knights of the Sword the clerical spellcasting ability. So at 4th level Knight of the Sword casts cleric spells as a 1st level cleric. The maximum level at HF is 10 so Knights can cast spells as 7 level cleric at maximum. If you searching for a balance between heroes don’t bother there wasn’t any intention to do so. To be a Knight of Solamnia carries more burdens than benefits. We a good storyteller you can have any number of complications to weight down your extra powers. Finally at level 8th Sir Brandon undertakes a new perilous mission that leads him to edge of the world. He returns victorious and now he is ready to join the ranks of the Knights of the Rose. So at 8th Sir Brandon add the final Aspect: that of Knight of the Rose. Under this aspect Sir Brandon is completely immune to the fear effects. You don’t have to go through all orders in order to be knight of Solamnia. You can choose for example stay a knight of the Crown or advance until a knight of the sword and not that of rose. Storyteller must remind the players that each step higher comes with extra responsibilities. Because we can’t be a proper knight without the titles I present you a selection of one taken from Tales of the Lance. · Spellcasting: Adhere to the box Tales of the Lance I believe it’s better to give the knights clerical spells as per core rules but the spell slot are been replenished per week preventing the overpower issue. Also in order to cast spells as 7th level cleric you must not shift to Knight of the Rose ranks leaving the spells to the truly devoted ones. If you choose to take the 3 levels as Knight of the Rose then your maximum spellcasting level would equivalent to 4 of clerics.